They say Live for the moments you just cannot describe in words....like watching a glorious sunrise announce a new beginning, admiring the lush hills, enjoying a romantic dinner with your loved one and for a few like us... imagining the limitless horizon from the depths of an infinity pool. For us its no less than magic!!! Barefooted and wild haired and without a worry in the world, we love tickling our imagination as the contours of an infinity pool blend into beautiful vistas of natural landscapes or in a few cities, a brilliant skyline. 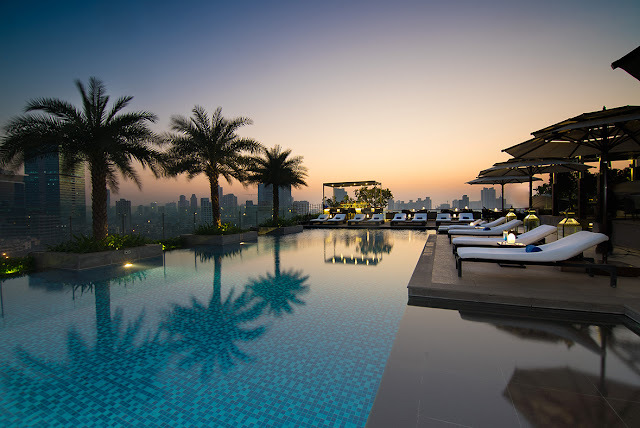 In two fabulous parts, Fashion Tourists lists Infinity Pools that face stunning vistas of cities, lakes, oceans and mountains that shall make you drop everything and immerse in their opulence. Go for a dip in the Rooftop temperature-controlled infinity pool at the Leela Palace Delhi and take a break from the stresses of everyday life as the cityscape intensifies your experience. Inspired by Lutyens Architecture, the Leela palace is an abode of luxury and spares no effort in pampering its guest right from a grand entrance with massive sculptures of elephants, ultra plush interiors with creative expressions such as a lotus mural, Devi sculpture, detailed marble carvings, paintings and many more from renowned artists to hi-tech features in the rooms such as JBL docking station to control audio-video devices and the Ad Notam Mirror Television next to the bathtub. We recommend you pamper yourself at the spa by ESPA designed by Jeffrey A. Wilkes, Unwind on champagne while you read a book or have a cozy conversation with family and fellow guest at the opulent Library Bar and later on get ready for a culinary delight at The Qube (Multi Cuisine), Jamavar (Indian Specialty Cuisine), Le Cirque (French-Italian Cuisine) and Megu (Japanese Cuisine). Depending on how deep you pockets are, you can choose from the Grande Deluxe Rooms to the 4,800 Square Feet Presidential suite that is palatial with state of the art facilities and guess what? A chauffeur driven Rolls Royce at your service. Get ready to get addicted to luxury. 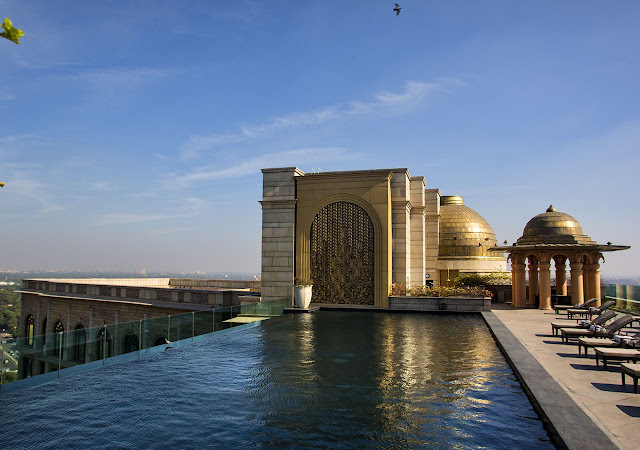 The infinity pool at the tallest luxury hotel in India with breathtaking vistas of the city will give you joys that tranquillize the mind and body. Yes it’s Mumbai, that city that never sleeps with plenty of options to entertain you. We recommend some retail therapy at the Palladium Mall, early dinner at any of the numerous eateries around the area and then dance the night away at the highest nightclub and lounge in the city on the hotels penthouse floors. Are you ready to set the floor on fire? If you are the type who likes to keep it light and easy, go ahead for the spa treat on the wellness floor and opt for any of the award winning fine dining restaurants offering amazing cityscape views. 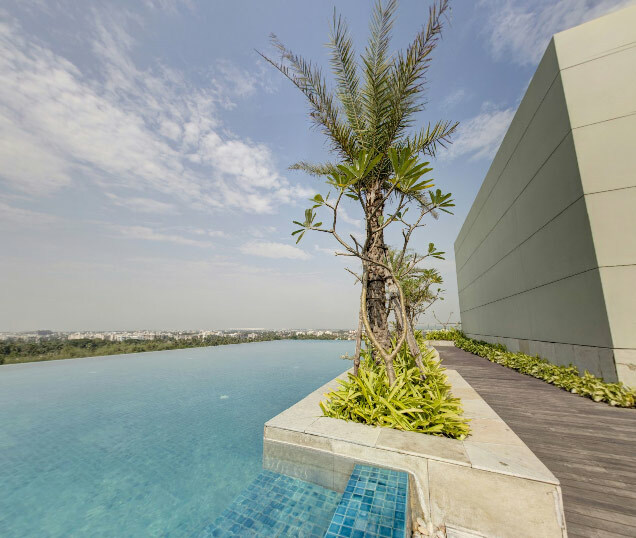 The roof top infinity pool at the Swissotel, Kolkata offers stunning view of the city skyline. Relax and unwind with your favorite tipple as you watch a beautiful sunset. Known for its Swiss hospitality, luxury awaits you at this property with suites having exclusive outdoor Jacuzzi and large open terraces. You can shop or catch a movie at the mall attached to the Hotel. If you are a party animal, groove at the in-house nightclub with resident DJ playing pulsating music. We recommend dining at the award winning Sky Lounge while you soak up the amazing view of the city. 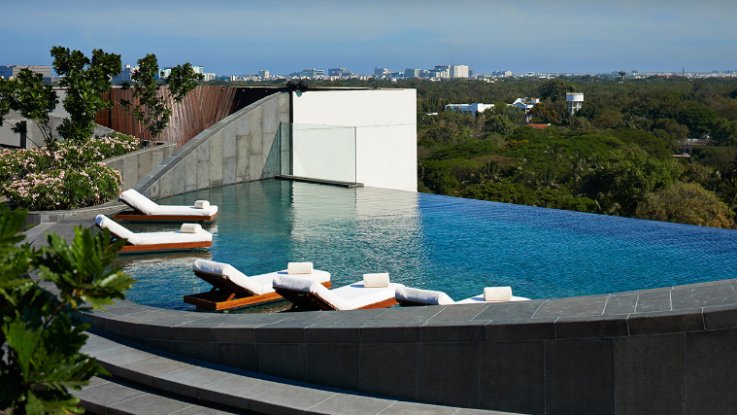 Refresh yourself from the humid Chennai weather at the infinity pool of the Park Hyatt. Overlooking the Guindy National Park, this rooftop Oasis offers a blissful view of the sparkling water blending into the horizon. 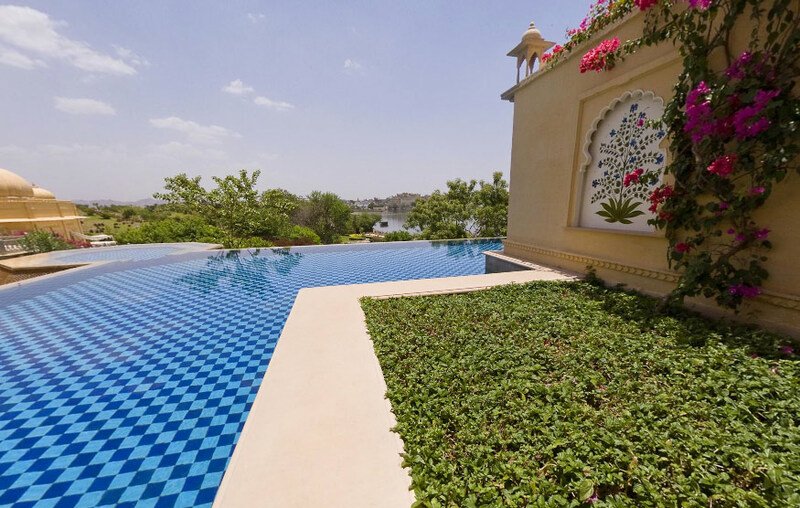 The private infinity pools at the Oberoi Udaivillas with sublime view of the city palace and Aravali range will calm your senses in a truly magical setting as you experience majesty and grandeur. Located on the banks of the Pichola Lake and spread over 50 acres which includes 25 acre wild life Sanctuary, the Oberoi Udaivillas is a luxury boutique hotel and recipient of numerous accolades including “Best Hotel in the World”. As you arrive in style across Lake Pichola by private gondola, you will fall in love with this place immediately. The exterior majestic designs of golden domes, grand courtyards, fountains, floating lotus pond, hand carved stone columns and the delicate interiors of hand painted ceilings to celebrate different moods such as the night sky in the Udaimahal restaurant are a visual treat for the senses. Depending on how much you intend to splurge, choose to stay in any of the opulently appointed rooms. The Premier Lake View rooms open into semi private pools, the Luxury Suites have private infinity pool and the Palatial 2 bedroom Kohinoor Suites has a master bedroom that opens into a 20 meter private pool. Unwind with Yoga, take a master class from one of the Hotels Chef, play a game of croquet on the hotel lawns or simply enjoy a tour of Udaipur with a guided walk of the City Palace. We recommend taking picnic basket with you on a private gondola ride. How romantic does that sound? Surely you must be Hungry by now? Well fine cuisine awaits you at the 3 restaurants – Suryamahal, Udaimahal and Chandni which has alfresco dining accompanied with traditional music and dances. The property will also take exceptional care of your kids by indulging them in activities such as elephant and camel ride, treasure hunts with a gift for every child, kite making and flying. The Junior Hotelier program is very interesting as it introduces children to the hotel industry. But the icing on the cake is the pink milk and personalized biscuits with your child’s name written in icing at bedtime. It doesn’t get better than this. Cheers to another one for your bucket list. Experience timelessness at the infinity pool of Orange County located at the edge of the Kabini River as you soak up the sublime view of azure waters and a magical sunset. 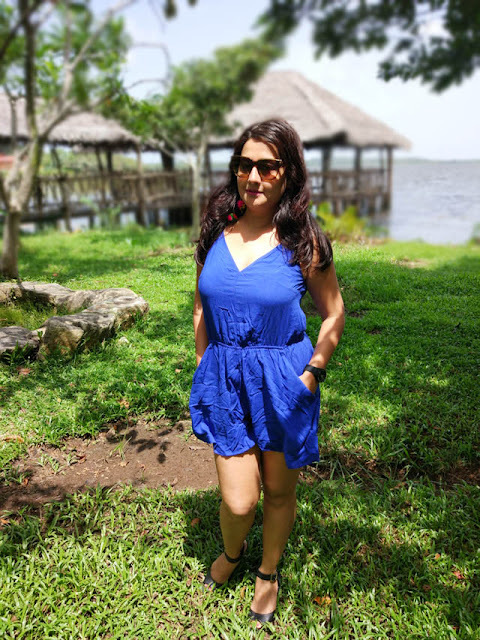 Featured in National Geographic Traveler in the list of 25 Best Ecolodges in the world, this picturesque resort has luxury huts built in traditional Kadu Kuruba style architecture and is flanked by Kabini River on two sides. You can opt for the palatial Pool Huts with a private plunge pool or Jacuzzi Huts with private Jacuzzi. Unwind by reading your favorite book at the Reading Lounge sipping on steaming cappuccino brewed from Sidapur (Signature house brand), lazy around in the family pool or indulge in some ayurvedic spa treatment at the Vaidyasala. Embrace the spirit of the land through activities such as Boat Safari, Vehicle Safari, Coracle ride, Night trails and many more. Enjoy the performance of the Kuruba Tribal Dancers around a campfire on alternate nights. If you are honeymooning arrange for private dining by the river or a Candlelight cruise on the river and take home a memory that will last forever. Delight your palate with some amazing culinary experience at the Honey Comb. We recommend heading early for a sundowner watching the russet skies of a spectacular sunset. 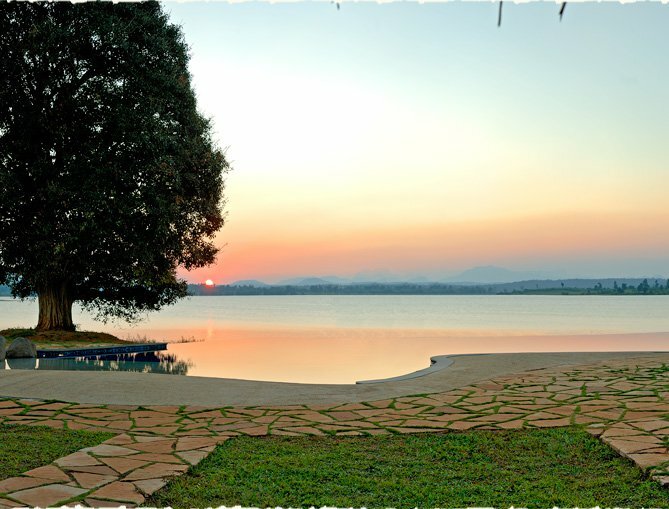 If you like barbeque head to the Kuruba Grill and relish your kebabs in a tranquil setting overlooking the river Kabini. Best of luck in spotting the striped star. 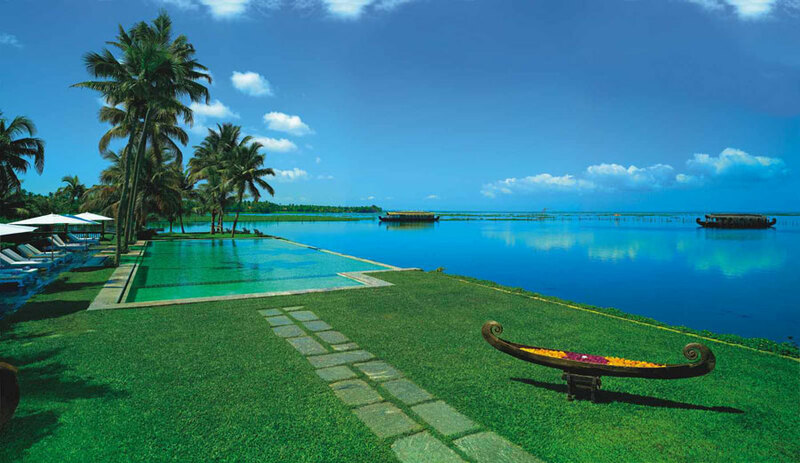 Relax, refresh and rejuvenate at the infinity pool of Kumarakom Lake Resort overlooking the serene Vembanad Lake as you experience tranquility of the emerald green waters in paradise untouched by time. Set in 25 acres of rolling green landscapes with intersecting canals and bridges; choose from any of the luxurious rooms or houseboats. We recommend the very popular meandering pool villas opening directly into a 250 metre river like pool which goes around the villas. Pamper yourself with an ayurvedic massage, take a sunset cruise with soothing traditional live music or spend a night out on backwater cruise in any of the houseboats. Avid bird watchers can head to the bird sanctuary. Additionally you can indulge in some fishing with bamboo rods or try your hands at pottery. We highly recommend a canal cruise on the traditional wooden canoe as you get to view natural floating lotus gardens and also observe the daily life of locals who live along the canals. At evenings, do not miss the tea and local snacks served at Thattukada– a traditional Kerala tea shop recreated in its authentic and rustic beauty. The tea is refreshing and the banana fritters delicious. Have a sundowner at the pavilion and later try the sea food specialty restaurant – The Vembanad located at the edge of the lake with open air sitting. If you are not a sea food fan, opt for the Ettukettu multi-cuisine restaurant and enjoy cultural shows including Bharathanatyam as you dine. Savor your time in Gods own Country. 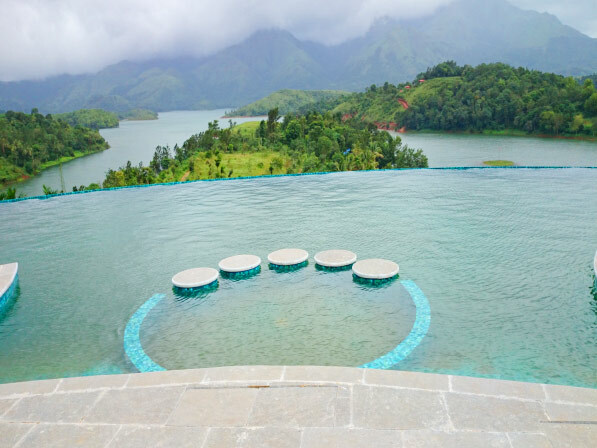 Revitalize among the splendor of mountains of Wayanad at the infinity pool of Sharoy Resort overlooking the Banasura Sagar Dam as serene water, fragrance of wild flowers, whistling wind and sounds of birds nurtures your senses. Set in a panoramic vista, you can choose to stay in any of the 7 cottages - Horn Bill - Villa Cottage, Emerald Dove -Royal Cottage and Golden Oriole -Honey moon Cottage. Relax in the lush green surrounds on picnic benches offering spectacular views and forget the hustle bustle of daily life by indulging in some spa treatment. 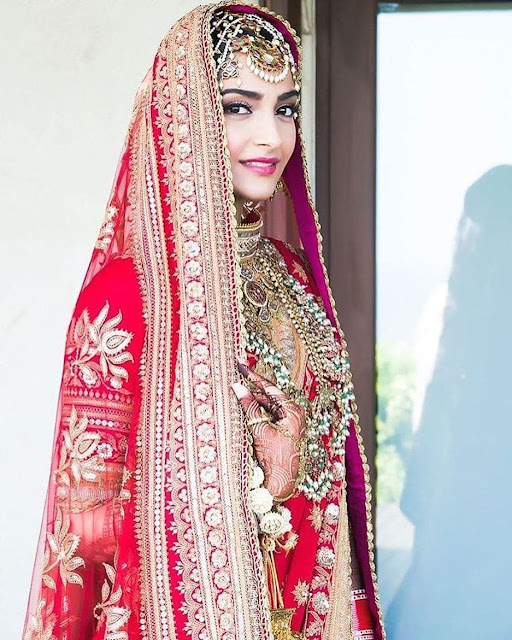 If you are honeymooner, you can opt for the special honeymoon package complete with full body ayurvedic massage and candle light dinner with a special cake and campfire. Adventurous folks can try bamboo rafting and Banasura Hill Trek or Chembra Peak Trek. You can also try your luck with fishing, archery or take some sightseeing tours nearby – a popular one being boating activity on the Banasura Sagar Dam. Ready to unleash the traveler in you? 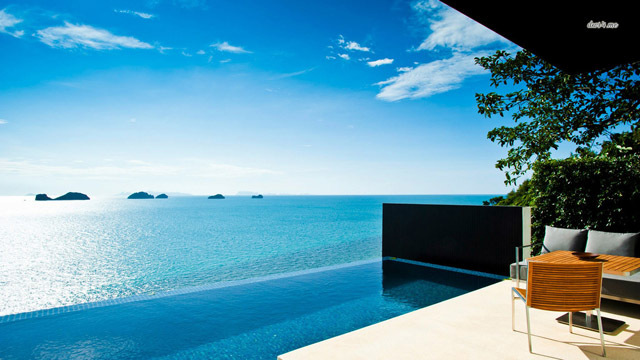 These infinity pools are so lavish, they might invite you submerge in their depths the whole day. In part two we list infinity pools that tempt you with vistas of mountains, landscapes and oceans. Coming up soon!